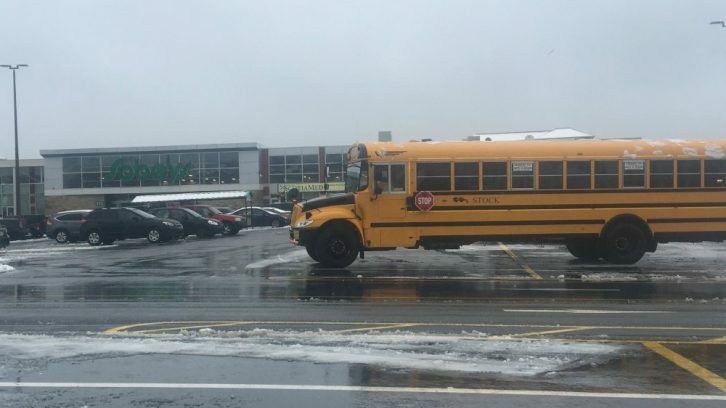 The first snowfall of the season caused problems for Stock Transportation in the Halifax Regional Municipality, angering some parents. The Halifax Regional Centre for Education kept schools open Friday, as the forecast called for five to 10 centimetres of snow. However, most of the snow fell within a two-hour time span, and by 8 a.m. the roads were covered and visibility was low. This caused bus delays or, in some cases, the buses never made it to schools. Stock Transportation, the company that provides bus services for the HRCE, declined to comment, but a Twitter statement said the majority of students made it safely to school. The company did not specify how many buses were delayed or didn’t make it to school. Fennell decided to drive her children when she saw it was snowing. She said her issue is with the company, not the driver. “(It’s) because of the relationship I have had with Stock this year, where they haven’t been communicating or they haven’t been really saying much,” said Fennell. She said the drive to the school usually takes five minutes. On Friday it took an hour because cars were stuck and sliding on a hill leading to the school. She also said they arrived ahead of a few buses and at the same time as a teacher. In Halifax, Stock Transportation started using a website called BusPlanner this year. Parents can sign up and get an email notification of transportation changes. Fennell said she didn’t hear from Stock until 11:30 a.m.
“I mean, those are our little humans. We like to make sure they’re safe and know that they’re there (at school),” said Fennell. Doug Hadley, spokesperson for the HRCE, said there is an expectation that if there’s a delay greater than 15 minutes, Stock Transportation will send out a notification to parents. Stock Transportation said in their statement they were told roads would be safe during an advisory call, despite the forecasted snow. They apologized for the inconvenience. Monique Fong Howe’s son goes to Lockview High School and his bus stopped at Beaver Bank-Kinsac Elementary. She said the driver wanted to see if the weather would clear up, before trying to go up a hill. When the weather didn’t clear up he asked if students could get their own rides to school. Fong Howe said only three kids remained on the bus, including her son. Her son wanted to go back home, so the driver drove him back. A few buses parked in the Sobeys parking lot in Bedford. Kevin Cox, who works at Sobeys, said he noticed them around 8 a.m. or 9 a.m. By 10:30 a.m., he said he handed out water to the children after consulting with police. He said they were not allowed to give food to the children. Hadley supports the drivers’ actions. “If a driver feels it is unsafe, we would much rather that driver pull over and communicate why they pulled over then driving in conditions that are not safe,” said Hadley. In the morning, the HRCE’s website posted that five to 10 centimetres of snow was expected, with good visibility. Stock said buses could drive, so schools would remain open. Hadley said parents will disagree, regardless of what decision they make during storms. He said they should use their own judgment when deciding whether or not to send their children to school.